There are sects among the Hindu population, some are devoted to certain deity – Shiva, Vishnu, Shakti. To each, they find solace and answers and continuity of their tradition in following their sect. One such sect which follows not just one but 5 deities is the Smartha Sect. Smartha is a Sanskrit word, which denotes the “smartha sampradayat”, a liberal or nonsectarian tradition or denomination of the Vedic Hindu religion, which accepts all the major Hindu deities as forms of the one Brahman, in contrast to Vaishnavism, Shaivism, and Shaktism, the other three major. They are the Hindu sects, which revere Vishnu, Shiva, and Shakti, respectively, as the Supreme Being. Smartha in Sanskrit is “relating to memory, recorded in or based on the Smriti, based on tradition, prescribed or sanctioned by traditional law or usage,”, from the root smr; Smarana. Smartas are, therefore, followers and propagators of Smriti or religious texts derived from Vedic scriptures. Smarta religion is practiced by people who believed in the authority of the Vedas as well as the basic premise of Puranas. The 8th-century philosopher was the founder of the Dasanami Sampradaya of Hindu monasticism and Sanmata of Smarta tradition. He introduced the Pancayatana form of worship. Adi Shankara is believed to have propagated the tradition of Shanmata (Sanskrit, meaning Six Opinions). In this six major deities are worshipped. They follow a philosophical, meditative path, emphasizing man’s oneness with God through understanding. It is based on the recognition that Brahman (God) is the highest principle in the universe and pervades all of the existence. Adi Shankara is most known for his systematic reviews and commentaries (Bhasyas) on ancient Indian texts. Shankara’s masterpiece of commentary is the Brahmasutrabhasya (literally, commentary on Brahma Sutra), a fundamental text of the Vedanta school of Hinduism. Shankara’s stotras considered authentic include those dedicated to Krishna (Vaishnavism) and one to Shiva (Shaivism) – often considered two different sects within Hinduism. Scholars suggest that these stotras are not sectarian, but essentially Advaitic and reach for a unified universal view of Vedanta. Shankara considered the purity and steadiness of mind achieved in Yoga as an aid to gaining moksha knowledge, but such yogic state of mind cannot in itself give rise to such knowledge. To Shankara, that knowledge of Brahman springs only from an inquiry into the teachings of the Upanishads. He believed there are grades of reality with Brahman being absolute reality while the jiva and Jagat while empirically existing do not exist from the absolute point of view. Jiva is really Brahman itself. So they basically believe in the essential sameness of all deities, the unity of God, and their conceptualization of the myriad deities of Hindus as various manifestations of the one divine power, Brahman. The Vaishnavas and some Shaivas are the principal monotheists among Hindus who worship Vishnu and Shiva as the respective supreme godheads. An orthodox Vaishnava will consider all other Hindu gods and goddesses as devotees of the supreme godhead, Vishnu. (Truth is One; Sages call It by various names). The Hindu deities though appearing to be different and independent are really facets of the same Brahman, the Supreme Reality. In the Personal aspect God can appear to the devotee in any Form the devotee likes and if necessary can even incarnate among humans. When you think of God beyond space, time and causation, the Absolute aspect, then God defies description. Thus Hindu Gods are particular namarupa (name and form) of Brahman. Since Hindu Gods and Goddesses are namarupa of Brahman, there is great psychological and symbolical significance in their iconography. Since Brahman is infinite, Brahman has infinite forms. Yogis, sages and saints have actually seen these forms. Brahma, Vishnu and Siva and their consorts are the three major facets of Brahman. 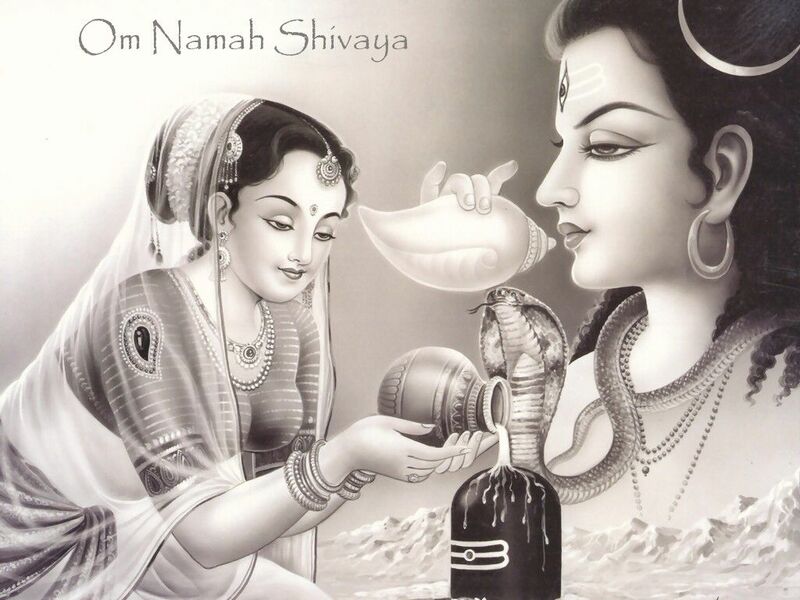 In Saktism, an emphasis is given to the feminine manifest through which the male un-manifested, Lord Shiva, is realized. Some believe goddess Durga is a personification of the power of Brahman. She is shown in a variety of forms. One common feature of these forms is that she is shown with a variety of arms carrying many weapons. The multiplicity of arms signifies that she represents the totality of Brahman’s power (i.e. Shakti). It is she who keeps the entire universe energized. She is shown with a lion and shown killing a demon. The demon stands for the various obstacles which prevent us from experiencing the divine. The main obstacle is our ego which when uncontrolled gives rise to lust, greed, jealousy, anger etc. The idea behind the founding of Smartism was to do away with certain practices in Hinduism, such as animal sacrifice; and also because Adi Shankaracharya believed in the concept of Advaita Vedanta, in which Brahman is the fundamental and highest reality above all gods. Yet the modern Hindu Society is tilting towards Smarthas in a practical sense. the current practitioners of Hinduism are converging towards the Smarta philosophy, where Shaivites accept and pray to forms of Vishnu and vice-versa. That Vishnu, Shiva, and Shakti are all forms of the same principal divinity is slowly gaining understanding and acceptance. The term Advaita refers to its idea that the soul (true Self, Atman) is the same as the highest metaphysical Reality (Brahman). The followers of this school are known as Advaita Vedantins or just Advaitins, and they seek spiritual liberation through acquiring vidyā (knowledge) of one’s true identity as Atman, and the identity of Atman and Brahman. Advaita Vedanta traces its roots in the oldest Upanishads. It relies on three textual sources called the Prasthanatrayi. It gives “a unifying interpretation of the whole body of Upanishads”, the Brahma Sutras, and the Bhagavad Gita. Advaita Vedanta emphasizes Jivanmukti, the idea that moksha (freedom, liberation) is achievable in this life in contrast to Indian philosophies that emphasize Videhamukti, or moksha after death. Advaita influenced and was influenced by various traditions and texts of Hindu philosophies such as Samkhya, Yoga, Nyaya, other sub-schools of Vedanta, Vaishnavism, Shaivism, the Puranas, the Agamas, other sub-schools of Vedanta, as well as social movements such as the Bhakti movement. An ocean, a single seer without duality becomes he whose world is Brahman, O King, Yajnavalkya instructed This is his supreme way. This is his supreme achievement. This Puranic religion is notable for the domestic worship of five shrines with five deities, all treated as equal – Shiva (the Supreme Deity), Devi (Shakti), Ganesha, Vishnu, and Surya. The five symbols of the major Gods are placed on a round open metal dish called Panchayatana, the symbol of the deity preferred by the worshiper being in the center. A similar arrangement is also seen in the medieval temples, in which the central shrine housing the principal Deity is surrounded by four smaller shrines containing the figures of the other deities. Some of the Smartas of South India add a sixth god Kartikeya. Smarta Brahmins specialize in the Smriti corpus of texts, are differentiated from Srauta Brahmins who specialize in the Sruti corpus of texts such as the Brahmanas layer embedded inside the Vedas. Smarta Brahmins are also differentiated from Brahmins who specialize in the Agamic (non-Vedic, Tantra) literature such as the Adi Shaiva Brahmins, Sri Vaishnava Brahmins, and Shaiva Kashmiri Pandits. However, these identities are not clearly defined, and active groups such as “Agamic Smarta Saiva Brahmins” have thrived. Ekadasi has two rules: Smartha and Vaishnava. The Smarta rule is simple – Ekadasi should be visible at the time of local sunrise. For the Vaishnavaites, Ekadasi should be prevailing two hours before sunrise. Ekadashi fasting spans for three days. Devotees take a single meal in the afternoon a day before fasting day to make sure there is no residual food in the stomach on next day. Devotees keep strict fast on Ekadashi day and break the fast on next day only after sunrise. Eating of all type of grains and cereals is prohibited during Ekadashi fasting.